Planning your own Circus Party? Purchase a custom set of our Vintage Circus Party Printables in our Etsy shop HERE! We promised it and here you have it, our very own Vintage Circus Themed Dessert Table! We’d like to take you through our process of creation, step-by-step by discussing how we came up with our theme and inspiration, to what we chose to serve and how we chose to serve it, to the little detail decor that helped bring everything together. Let’s get started! The first decision we had to make was of course, what kind of theme will we go for? Well we sort of stumbled upon the inspiration for our theme. Jason and I are bargain hunters when we venture out to shop, so it is only natural that we gravitate to the clearance aisle or bin or whatever you want to call it. During a trip to our local Michael’s craft store to return a few un-used items we did this very thing. Michael’s usually has a ton of dollar items in black bins near the front of the store. While browsing the bins we spotted the masks you see pictured (Lion & Zebra). We thought, “wow, Desmond’s birthday is coming up not too far off, we should incorporate these into the party theme and do a vintage circus!” The rest, as they say folks is history. We had a theme idea and a couple of masks to decorate with, where did we go next you might be wondering? Well online of course to browse the web for other vintage circus accessories. What we found however is that “vintage” mostly equates to expensive when it comes to serving pieces. So if you can’t afford what you like, but you still want the look what do you do? DIY it of course! The DIY White Pedestal above is just one of the several DIY projects we took on for this theme. Isn’t it cute? We thought so. Jason was really the mastermind of the stand, I just took the pictures :) Find out how to make it HERE. Our next step was to decide what we would be serving. Now that we had our theme down pat and our “look” well on it’s way, some food decisions had to be made. In keeping with the circus we decided on traditional junk food fare. Not really the healthiest of parties here, but certainly delicious and hey, you only turn two once right? Right. Where did we put all of that sweet stuff? Prepare for the link love. We used white melamine serving trays from Target to serve as our circus vendor snack trays, placing them on each side of the table for symmetry. 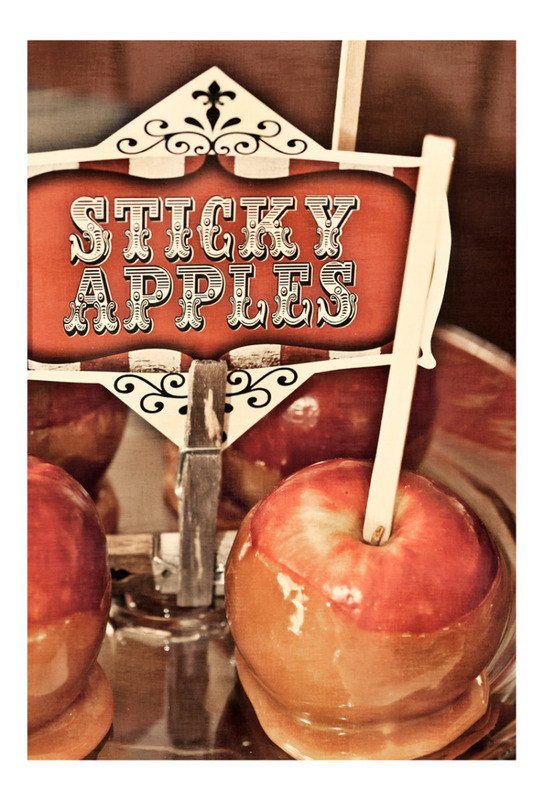 We used a simple glass cake pedestal from Pier1 for the Sticky Apples, as well as a constructed pedestal (one red melamine plate and a glass candlestick held together with krazy glue) for the Circus Peanuts, which we placed in the center of the table for our mid-height displays. A small glass footed bowl from AC Moore was used to hold the clown noses and also placed in the center. We used a small zebra striped dish from Pier1 and a large white rectangular serving platter from Crate & Barrel for the corndogs and pretzels, which we placed in the front center of the table for our low-height displays. We used a tall footed vase we found on clearance from AC Moore for the Lion Tamer Whips which we placed in the back left corner of the table for our high-height display. Our DIY White Wooden Cake Stand held the salt-water taffy and stood in the back on the right side of the table to complement the high-height display and make our display more symmetrical. 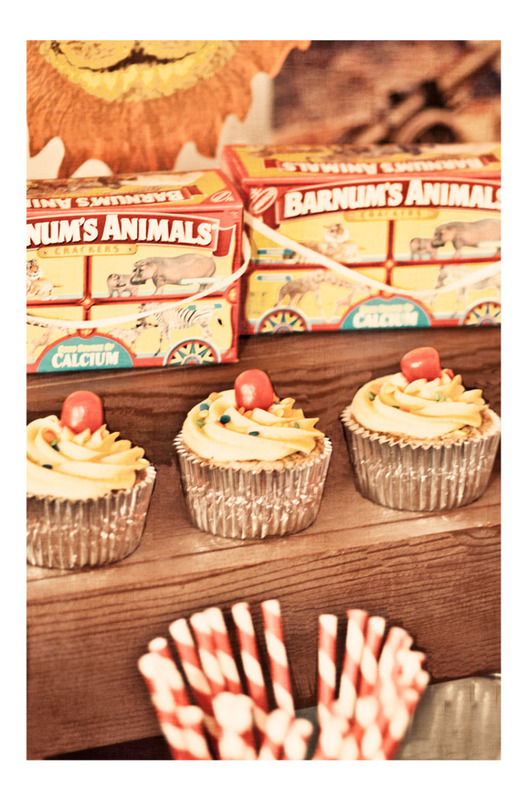 Our DIY Wooden Risers kept things grounded in the back as a high-height diplay for our cupcakes and animal cracker boxes as well, which helped pull together the vintage circus theme by emulating what spectators used to sit on at the circus. More details please! Where did you get all that awsome circus decor? We splurged a whole eight cents a piece for the cutest red and white striped paper straws from Garnish. I am sure you all have seen these all over the internet so we did not want to disappoint you by leaving them off our table. The DIY Circus Tent was our big experiment. The original idea was to use a pole in the center of the table and somehow drape our tent fabric (a tea stained white sheet) over it and make it look like a tent. Logistically we couldn’t figure it out, bummer. With time a wastin’ we decided on a different idea and hoped for the best. The end result was our big red tent fashioned from crepe paper.We were pleased with how it turned out in the end but beware the ceiling fan as it does not play well with crepe paper. What vintage circus is complete without a row or three of DIY Wooden Risers in the back for the spectators to sit on? Jason and I formulated a plan to build a set of three risers for more authenticity under the big top. We used small 1x2 boards to make a stair like frame then added a few supports underneath to keep it upright and finished by painting it brown to blend in with the scene. The vintage circus posters were indeed vintage circus posters. With our handy dandy friend Google Image we found several old poster images online which we had printed at our local copy shop at 11x17. They were a bit pixelated from being blown up large but from the distance most people were standing no one noticed and they made a nice back-drop for the table. 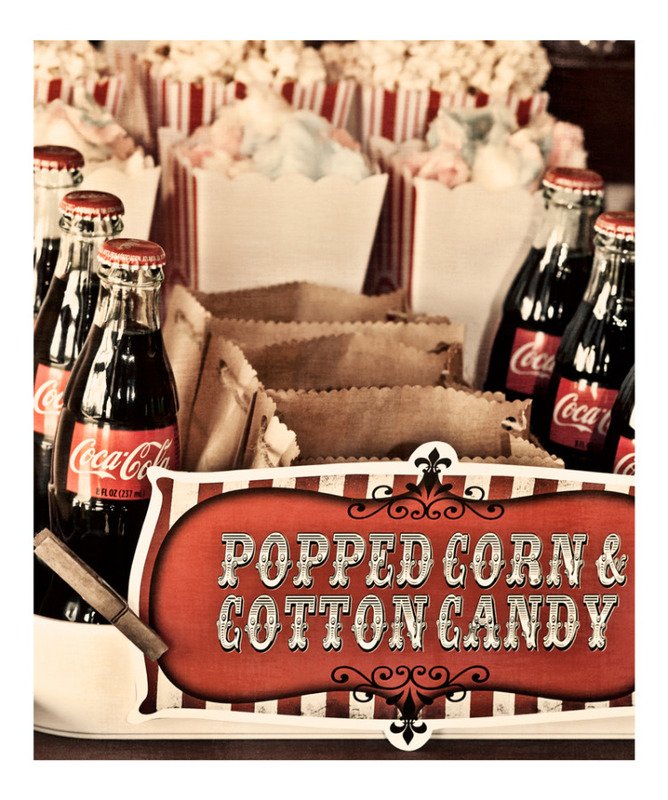 Our Vintage Circus printables were so fun to create. We really wanted a look that would tie everything together, so red stripes were the ticket. We also had these printed at our local copy shop and simply cut them out and secured them with weathered clothes-pins from our collection. That’s right. Clothespins, straight from the line outside, LOL. All in all it was a great success. Our guests were very satisfied with the fare, mostly with the corndogs which many people had not eaten in ages. The little man had a blast, which was the most important thing. If you have any questions on anything we may not have covered please feel free to leave us some comment love! This is our first table walk-through and we plan to have many more in the future so please add us to your RSS to keep up with our sweet blog :) Have a sweet day!